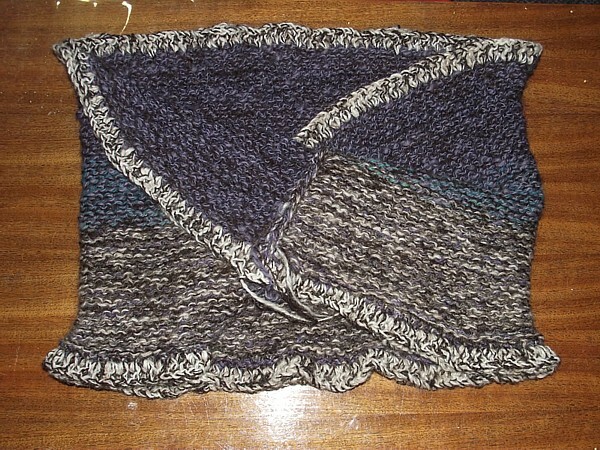 I have been knitting up a small storm of projects in the last year…. 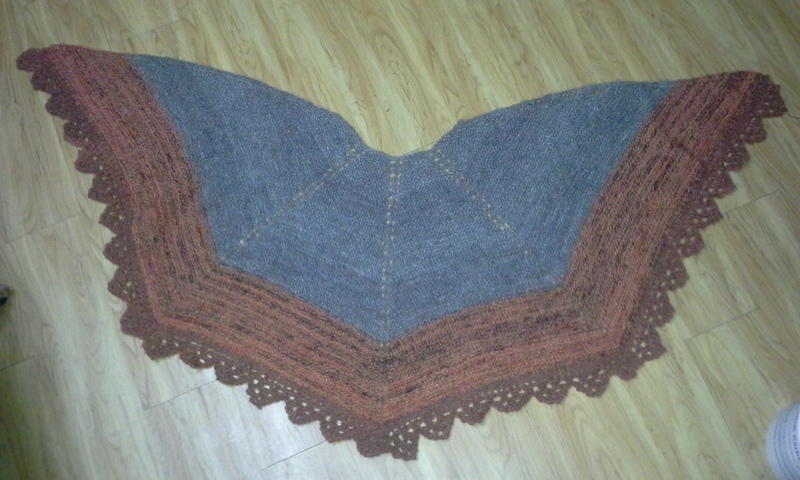 Sweaters, shawls, hats, mitts, scarves, cowls… I have been keeping the knitting needles pretty busy. Occasionally, I have pulled out the spinning wheel and done some work with it, not much though. 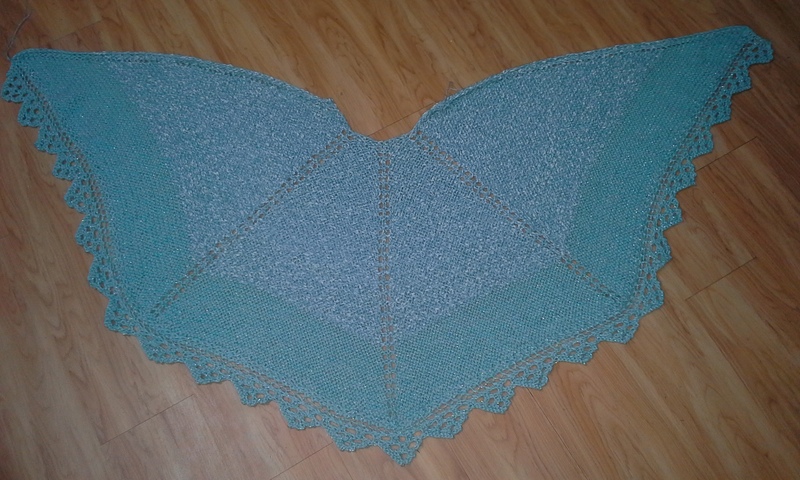 This shawl was made entirely from my handspun yarn! So lately the urge to spin has returned and it has been nice to finally get back into the treadle of all things spinning. 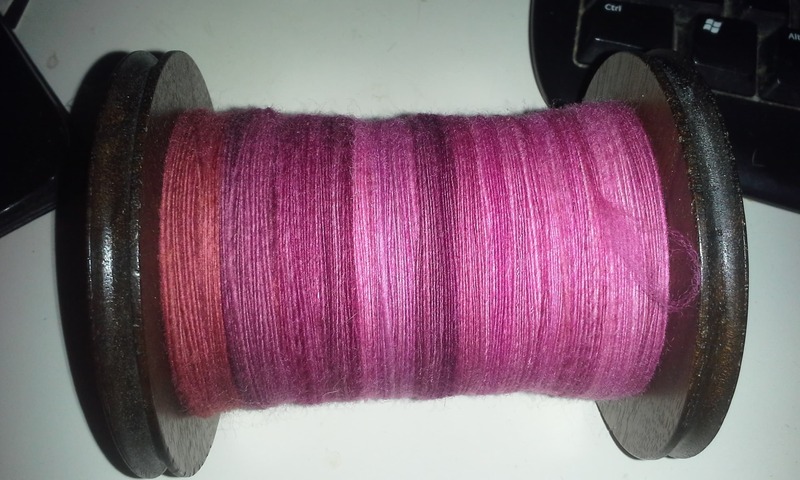 I finally finished off a roving I had started spinning up during 2018 (a lovely pink toned batch called “English Garden”) and started up a new roving (a multi-coloured batch called “Archangel”). 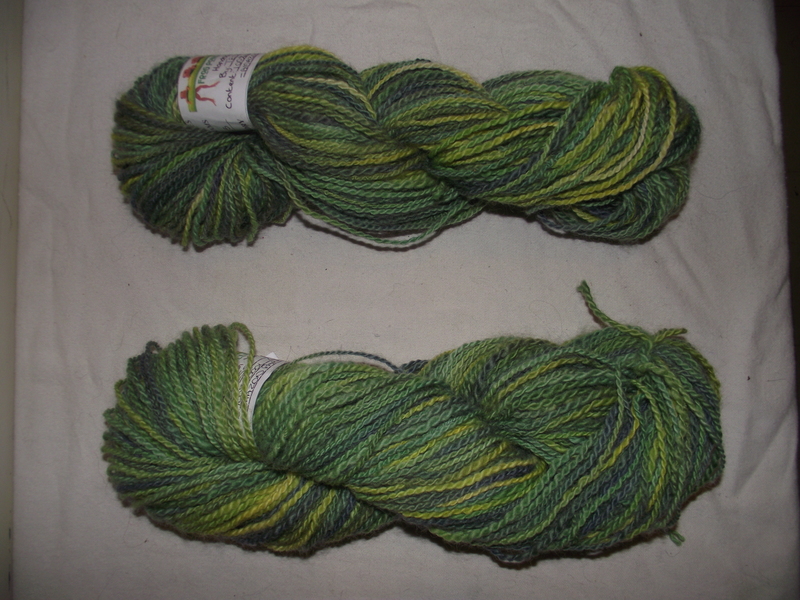 These are both 100% merino wool that I picked up when a local store was having a really good sale. They are being spun up very fine and then I will spin another single in a white merino wool & silk blend to ply with so the colours really have a chance to pop. This will take time, as I am only able to do around 30-60 minutes of spinning per day right now (due to the pain I am also dealing with) and the fact I am spinning it so fine… It will get done though! All things crafty are limited more than usual by health issues this winter. 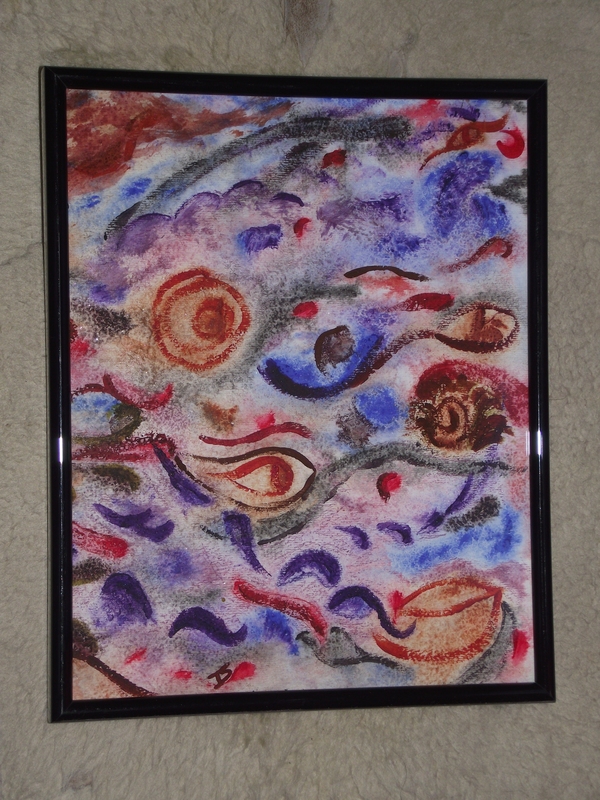 I have been on a new medication that has helped keep me from being totally blind-sided by the pain portion, so I am happy to take what I can grab in crafting time and do my best to fill as much of my day with it as I am able. In my youth I was more concerned with other things and trying to sort out yarn and needles, hooks and string or anything other than my mildly artistic doodling was overwhelming. I groused for years that I lacked the skills to save my life if crochet or knitting were involved. Reading, music, life in general took front stage and the attempts to craft were put in the closet of my mind. Fast forward to my mid 20’s. I found myself pregnant and desiring to make items for my soon to be child. Knitting was still too complex to fuddle through, yet crochet seemed more approachable. Success happened, soon I was creating gifts for cousins also expecting, toys, blankets and clothes for my son… Crafting was happening! That once complex means of creating things by hand wasn’t quite so complex and distant in my life, I was thrilled and began learning as much as I could about it. New stitches, reading patterns and charts, collecting hooks and patterns soon paved the way to my creating patterns to share with others. I could do this, finally I was a crafty person that could make items that even my very skilled great aunt approved of! Time slid away with crochet being my only crafting outlet until by my early 30’s I was interested in the skill of hand-spinning. 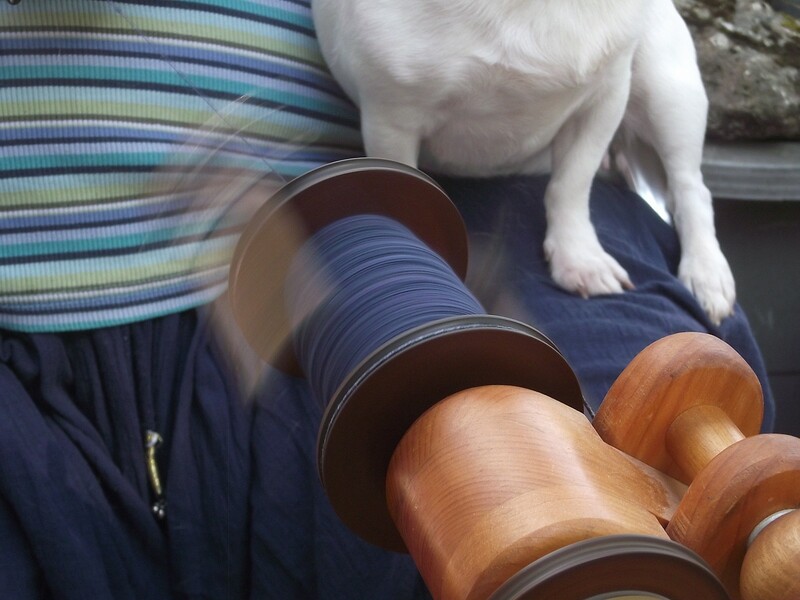 Taking a spindle or a spinning wheel and fiber and creating hand crafted yarn. 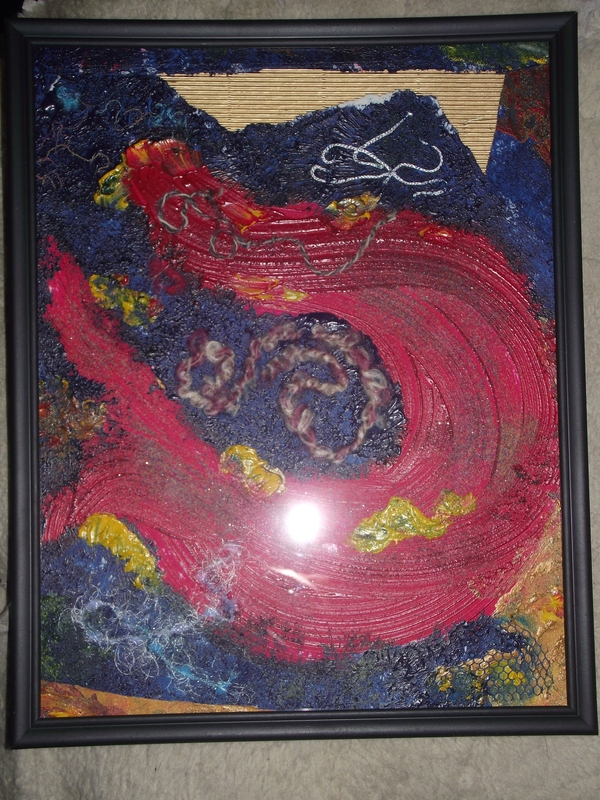 A friend of mine had learned how to do this in an art program in university, she did it often while we sat over coffee and chatted, I was enthralled by the craft and desperately wanted a spinning wheel of my own. Another friend happened upon a spinning wheel at a local yard sale and called me about it, arranged for them to hold it until I could get there and for approximately a 1/4 of the price brand new, I had my own spinning wheel. 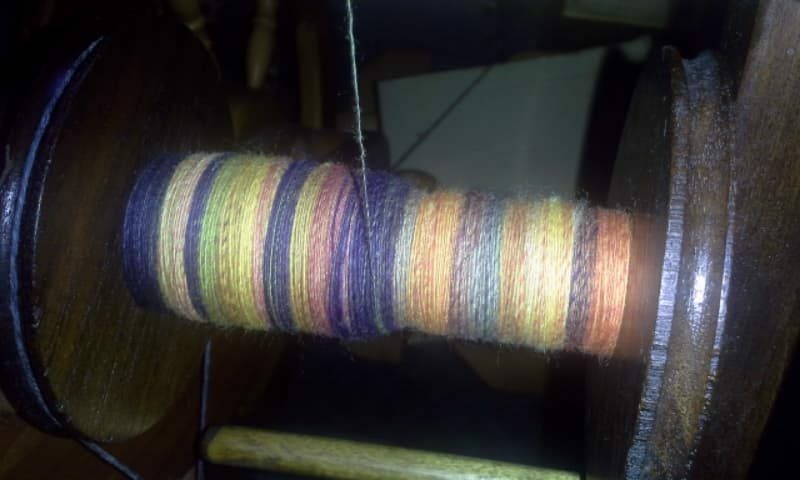 Within a week I was spinning as if I had been doing it for years, producing my own yarns from fiber I acquired from online groups and sources that introduced me everything from raw fleece to clean and processed fiber. Over the years I have tried so many of them… different kinds of wool, mohair, silk, cashmere, angora, dog fur and so much more. Thick, medium and fine yarns accumulated in my baskets, they didn’t translate to crochet as well as I hoped, so they languished, waiting for a purpose. Within 6 months of starting my journey as a spinner, I found a particularly large set of needles and took a chance in buying them as a gift for my friend. 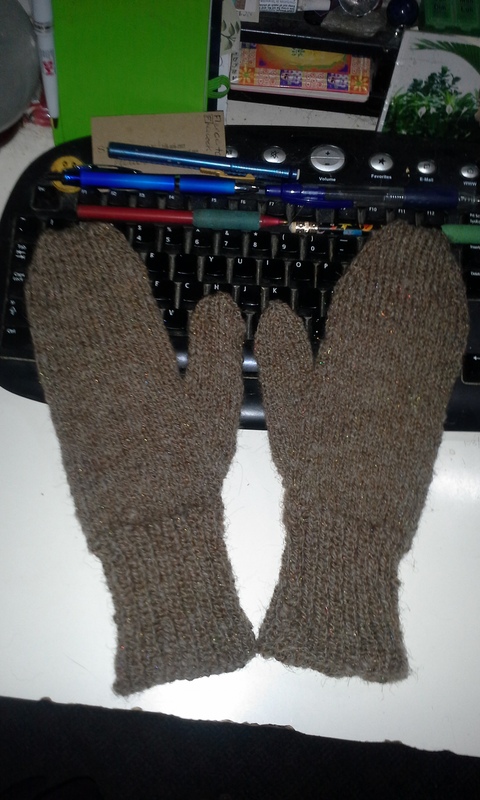 Instead, she used them to teach me how to knit. 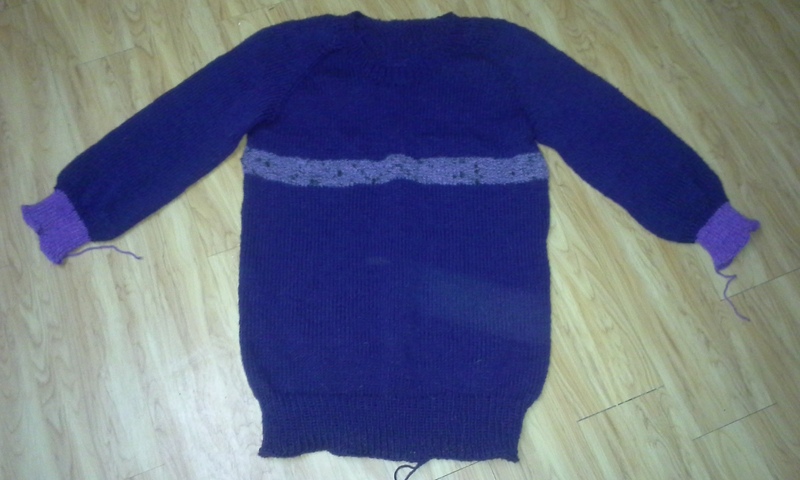 These large needles and a couple of strands of thick yarn, her patience, a little trial and error and some practice doing just the knit stitch and there I was knitting! I could do it, I could process it, it wasn’t nearly as hard as my young self had convinced me it was… There went I with much practice, learning new stitches and new things about this craft, deciphering patterns, collecting the various types and sizes of needles. 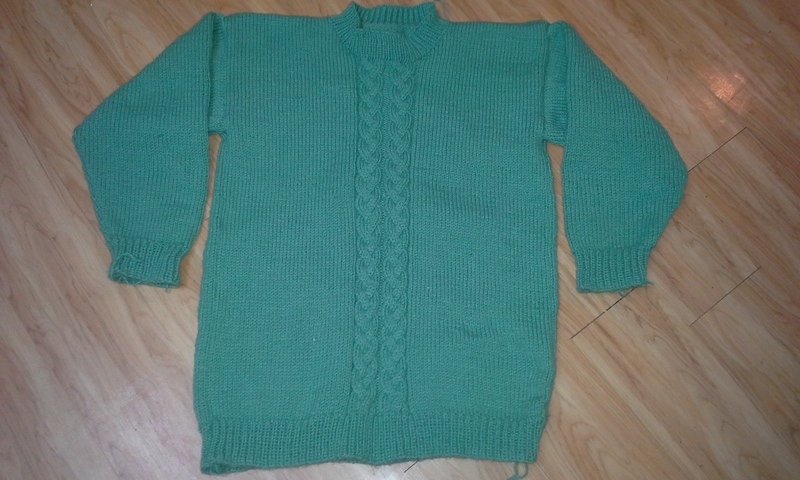 I could now knit. 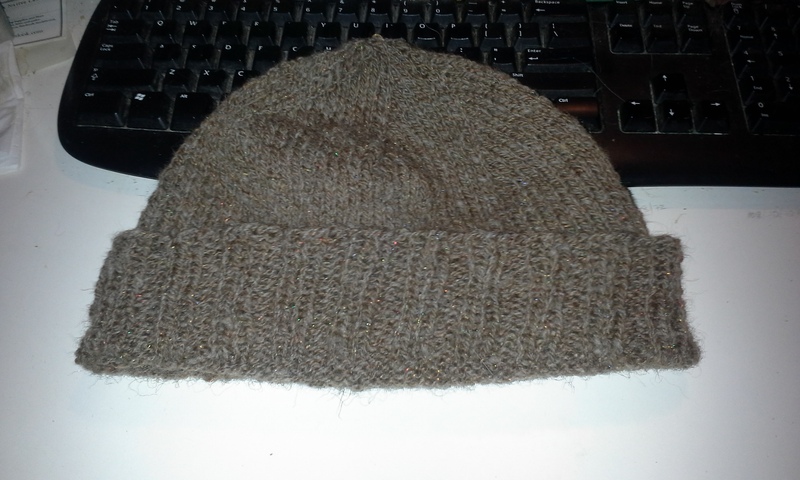 The joke was on me and I was teased about how I could now knit to save my life – LOL. I didn’t care, I was having fun, I was exploring this new field in my skill set and having a grand time. Now all these years later, I don’t crochet as much as I once did, knitting has taken over as my craft of choice… Slippers, socks hats, mitts, scarves, cowls, shawls and even a sweater among the things I crafted on my needles in the intervening years. There is a fairly large stash of yarns hidden and tucked away in odd spots of the house to feed the habit with, sometimes I go on the odd foray to the store to buy something for a specific project, otherwise I try to stick to what already lives here. 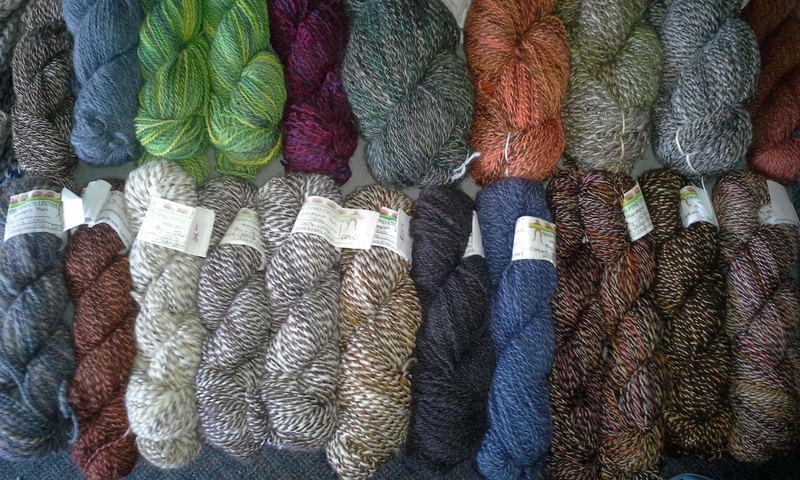 As well, I have a fair stash of hand-spun yarns, in spite of how much I have sold or gifted to other knitters. Years of spinning have produced a lot of finished skeins of my hand-crafted yarns and I have even taken to knitting things in it for myself and others, instead of holding on to it for “something special in the future”… My future is now and the yarns are finding a use in my knitting finally. I have a half dozen items for myself, I’ve done several items for my daughter-in-law, a couple for my son, an item or three for friends as gifts. Creating things by hand, even as far as creating the basic components from scratch is like therapy for me, the joy and accomplishment that comes from it is so much greater than I could have imagined all those years ago when I bemoaned my lack of skills. Sometime it takes time, maturity and the right teachers to make it happen. 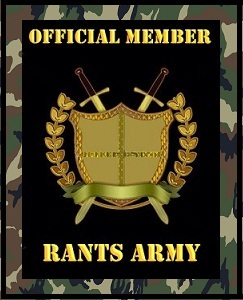 I have to say, I am plenty glad that all that and more have been a part of my life. I look forward to sharing some of what I do in the future… Hope you will enjoy taking that journey with me. 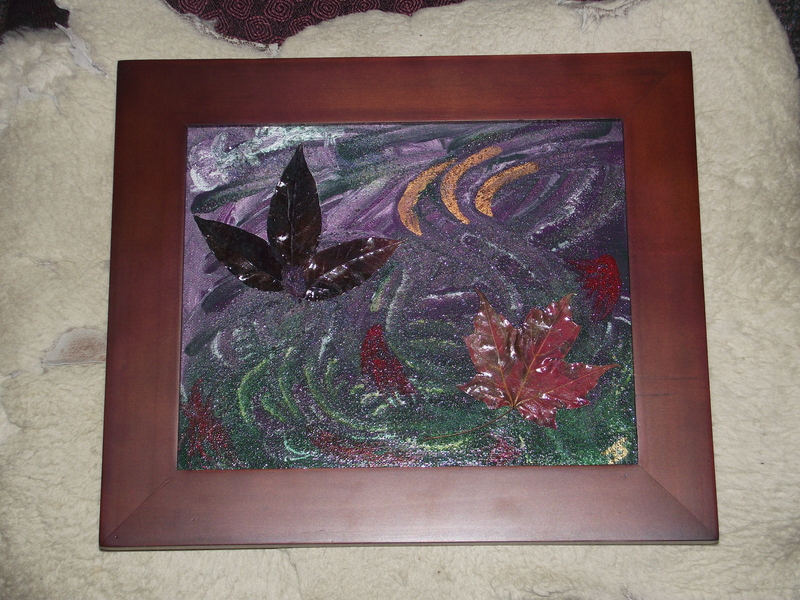 I had a very good year for making handmade gifts in 2013. A friend has opened up her studio one day a week and I have been doing some neat stuff there that ended up being good enough to offer up as gifts. 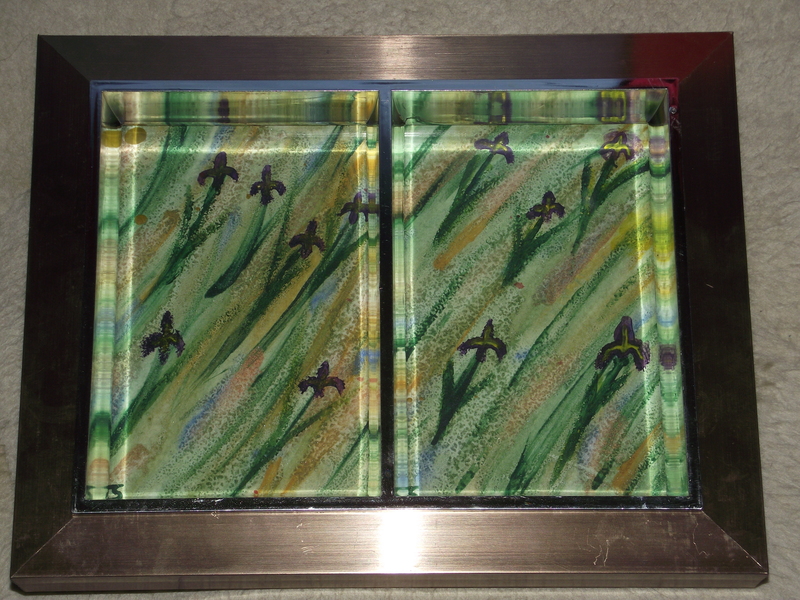 In fact I had at least two people as for certain pieces if I was in a mood to give them up. So after hunting down some nice frames and spending an afternoon doing the work, they were added to my pile of gifts that were ready to go. 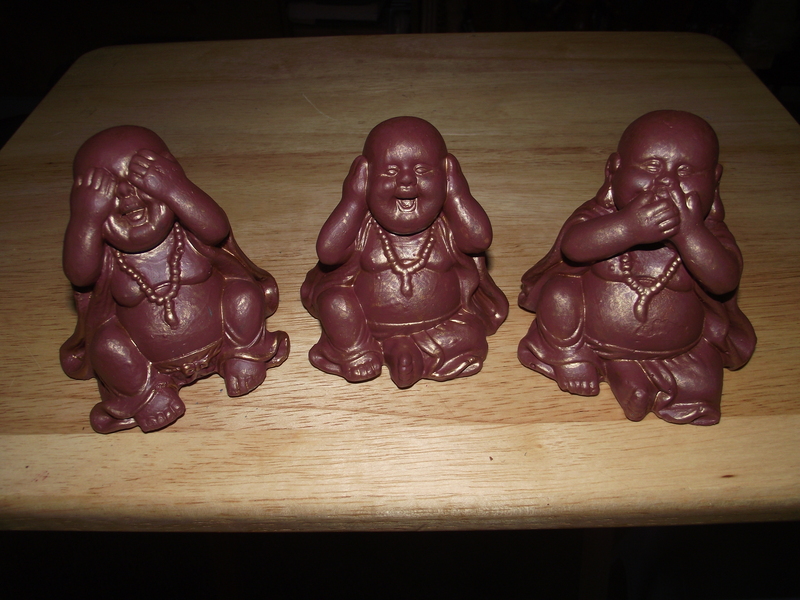 I found a sweet set of figurines that seemed to be perfect for my brother, except for the ghastly colour they were painted. Kind of a crap brown with a few badly placed spots of cream that were meant to be highlights. I spent the money [it was through a hospital gift shop, the money goes to fund the hospital] and decided to do a new paint job on them. I forgot to take a before photo, but here is how they turned out. 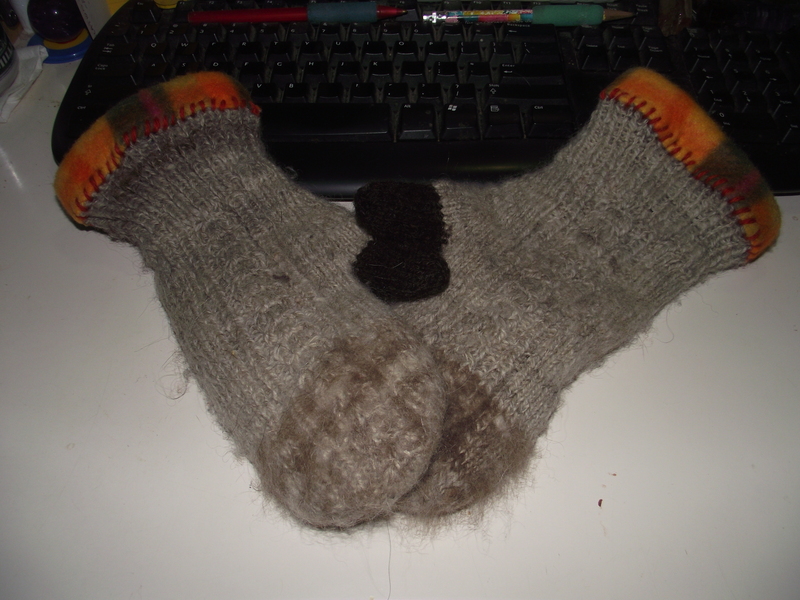 Next came the knitted goods… I meant to try and get it all done, but I was down to the wire on Son’s socks to the point were I forgot to snap a photo, but they got wrapped and packed in time for gift giving on the big day. 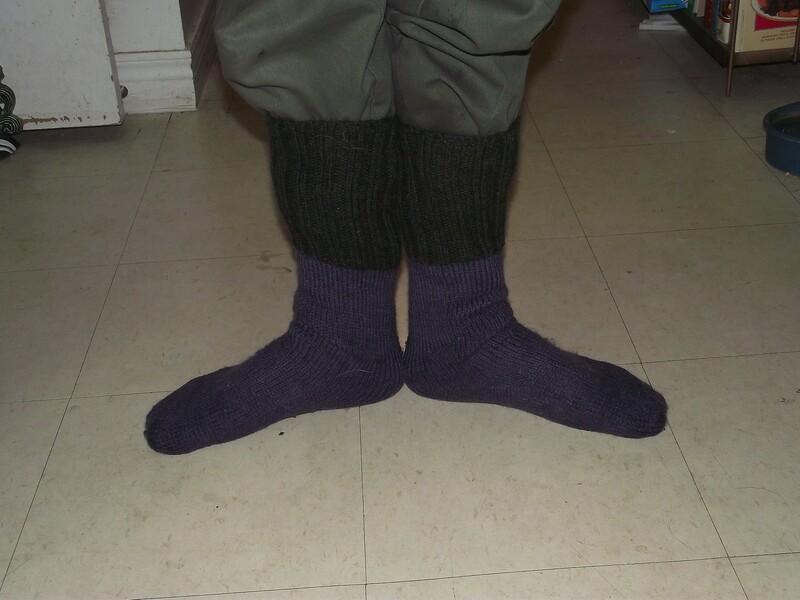 Here are some of the other things I did get done, a cowl and a pair of hand-spun, hand-knit, lined mitts for d-i-l. You will just have to imagine the socks in your head… tube style, green cuffs, purple foot… what can I say, the kids love funky socks! 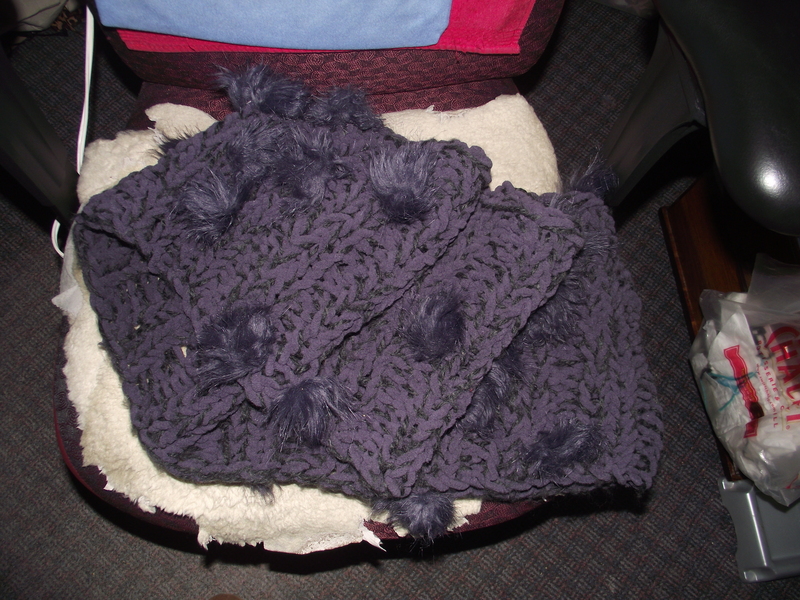 So that left the items in which only some of the parts were done and some were still in progress, the house vest for my mom [which BFF #1 was helping with] and a hand-spun, hand-knit mobious cowl for BFF #1. 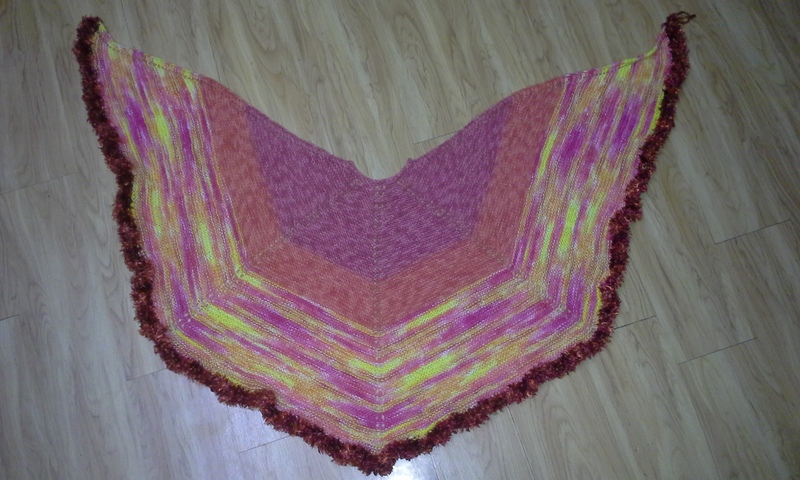 The Vest for mom still needs to be seamed and finished, but the cowl is done except for the sewing in of the yarn ends… looks pretty nice though, the trim has fur from her poodle who died a couple of years back spun into the yarn, so it’s a lovely memory piece for her too. 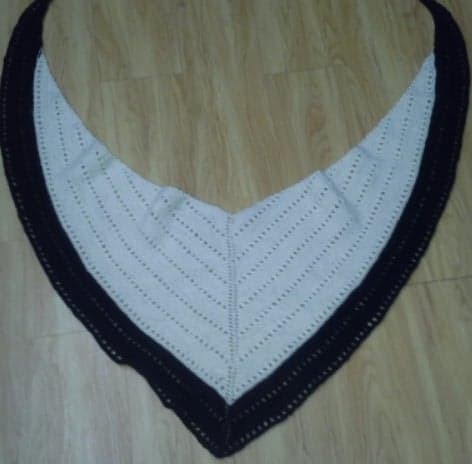 I will have to take a photo and share the vest when it is finally done, but I hope you have enjoyed my handmade gift gallery from the 2013 holidays. anyway, brilliant idea came about when I realized there were a pile of bread tags in a dish that we had been saving for some reason no one could remember and I was going to toss them out when I happened upon the idea of using them as ID tags for my skeins. 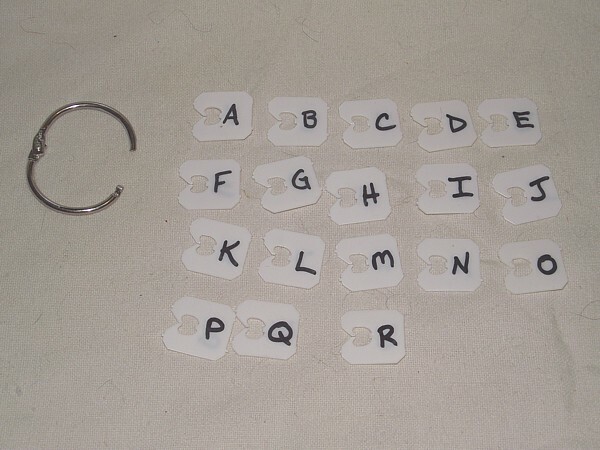 I picked out the white tags with no printing on them and with a sharpie marker I started labelling them “A, B, C, D, …” and so on until I got to R [ran out of tags at that point], then I grabbed hinged ring to keep them all together and neat while not in use. All I needed was a notebook and I started ID’ing my skeins and listing all the pertinent information on that skein under the letter on the bread tag. 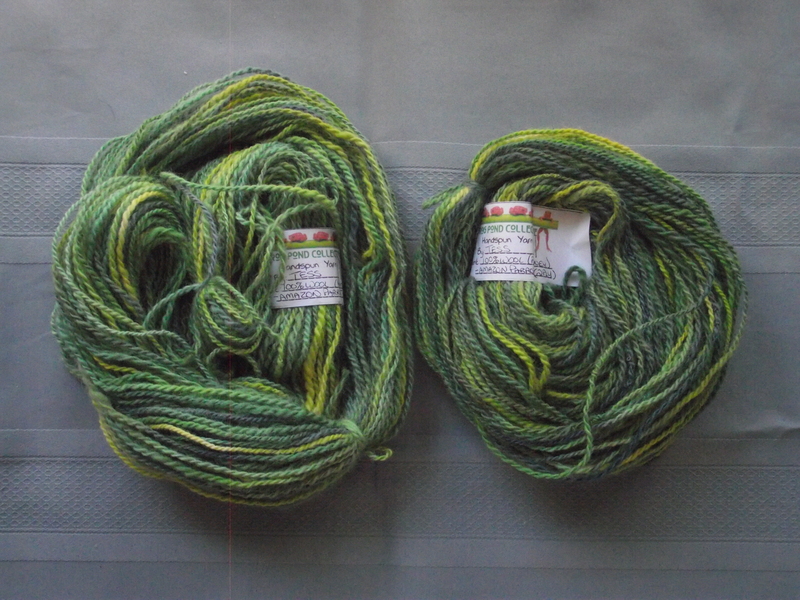 Finally got to a point where I really needed wash the skeins I had finished, or make up more bread tags and tossed all my skeins into a wash & rinse cycle… Lo & behold! There are all my skeins, clearly tagged and now I just have to refer to my notebook to create paper labels for each one once they are dry and ready for sale or storage. How easy [and cool] is that! I have a standing invite every Monday [that isn’t a holiday] to go to a friend’s Open Art Studio day. It runs from 3 pm to 9 pm and typically I take advantage of the full 6 hour stretch. She encourages me to do painting while I am there to get my head into a whole different artistic space for awhile, it’s genuinely fun, all the folk who show up end up spending time talking, laughing and sharing stories over a coffee or tea and I have come home with some fantastic work that is actually worth framing and hanging on my wall. So today I was not feeling so great, my head and body are all achy, head and nose are feeling like they are full of cotton and my nose won’t stop yelling for tissues – STAT! – It’s the fall allergy season; I’m used to this after years of suffering… I know it is going to be a stretch to haul my aching self there on the bus and then the congestion & cotton brain is just not the kind of thing that makes creativity spring up happy and free, so I opted to stay home and try to do something even mildly creative here. Today’s creative project was photography… No matter if you are a hobby crafter, an artisan, a cottage industry seller, or a whole sale Ebay master, you need pictures of your product if you are going to sell your product. Since I am a crafter of various crafts and try to sell what I can to help pay for the multiple hobbies I partake in [and for the simple fact I like the feeling when my stuff goes to people who are just keen for the handmade stuff], I needed to do the photo shoot thing to give my prospective buyers a decent idea of what I am selling. You see, while there is a huge truth in the saying that a picture is worth a thousand words, but there is also the codicil that says the wrong kind of picture can kill your story before it starts! The pictures I took back in February were only intended to be a visual inventory of what I had on hand and ready to sell, the pictures I was trying to get today are intended to interest buyers in these skeins of hand-crafted yarns; they have to make the product look good and that can be hard. There is a lot that goes into taking product shots; first you have to get it to look appealing, then you have to get the lighting right so the colours stay as true as possible, you can’t forget to keep them clear and focused so they can make out details you are trying to highlight. So my afternoon has been filled with controlled chaos and my already aching body has now added tired to the list of complaints, but I am a stubborn and move on… I need to try to keep track of what I have already done, don’t forget to work the presentation, lighting is important [keep an eye on it! ], details & keep it in focus, get multiple shots to cover all the bases – then times all that by a couple dozen skeins – it is very time consuming and a great deal of work, but in the end you look them over with fingers crossed that they look as good on the screen as they did in the camera – all that work for a bunch of crappy shots can break your heart and make all that work a futile effort. If they have all turned out as you hoped, then comes then next hurdle in selling online. You see posting and/or uploading them is the easy part, it is adding all the right details along side the right photo that can consume an afternoon or evening before you know it… so I cheated a little bit and made sure to take photos of the labels as well so that I can refer to the photo itself for the information, saving me the hassle of needing a written inventory and making posting them for sale soooooooo much easier! Then there is dealing with the clean-up afterwards, because you know you wanted to get the light while you could, so you just draped the skeins in a pile so you could move fast. A couple dozen rounds of twist and tuck gets them looking neat and tidy and so they don’t get messed up and/or tangled while in transit. In the end they are all tucked back into their travel case and stacked back with the other cases of items for sale. Now I can relax with a mug of tea and peruse a bit of this and that, a few hours of work to produce not so many pictures as one might think, but I have to say I am so very grateful for the digital age, this would have cost me a freaking fortune if I had to do all this on actual film! !